Rian Johnson will write and direct the eighth “Star Wars” movie, inheriting the franchise from J.J. Abrams, according to two individuals with knowledge of the director's plans. Johnson will also write the treatment for the ninth movie, but he will not direct it. To be directed by... J.J. Abrams? And the director is Colin Treverrow (rumors had been swirling at Comic-con last month). I think it is a bit of news seeing as Roger Deakins has just come out and said that film is dead. Does anyone know how the standalone films (which are basically prequels, hint hint) are being shot? "Lucasfilm and Colin Trevorrow have mutually chosen to part ways on Star Wars: Episode IX." Trevorrow--too edgy for Star Wars? Disney is clearing a path to hire George Lucas. 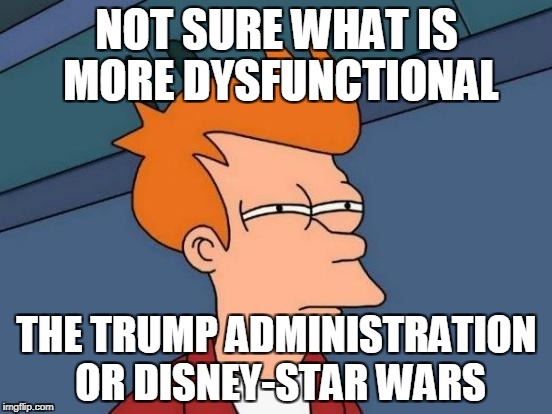 I think this was the Futurama meme you're looking for. Abrams. Well, get ready for Death Star 4.0. Kennedy: “With The Force Awakens, J.J. delivered everything we could have possibly hoped for*, and I am so excited that he is coming back to close out this trilogy." * Buckeye Jones: "Except new stuff." As I said at Facebook: So Colin Trevorrow, who got his start in blockbusters because he reminded Brad Bird of Brad Bird, is now being replaced as director of Star Wars: Episode IX by JJ Abrams, who produced Brad Bird's first (and so far only successful) live-action film. Funny how the young up-and-comers keep getting bumped for the well-remunerated establishment hacks (Ron Howard on the Han Solo film, Abrams here...). A new story at the Wall Street Journal says Colin Trevorrow lost the job because Kathleen Kennedy didn't like his script. So it didn't necessarily have anything to do with The Book of Henry or his post-Jurassic World ego, as earlier reports had it. But what I want to know *now* is whether Kennedy was always unhappy with Trevorrow's script, or if she was only upset with the direction it was taking after Carrie Fisher died and the filmmakers were forced to come up with a whole new, Leia-free storyline. Abrams and Lucasfilm execs met with several actresses for the role in the past two months and settled on Russell right before the Fourth of July holiday. . . .
It’s unknown at this time whether Russell will be on the side of the rebels or the evil empire. We have a title. The Dark Knight Rises, anyone? Nothing about this thing looks good. I feel a mild excitement for this, probably as a remnant of my childhood love for the originals. And it was nice to see Billy Dee Williams in the trailer. But I feel way more enthusiasm for, say, Game of Thrones' conclusion and (even moreso) the Deadwood film next month. My 40 freshman this quarter agree: Star Wars movies are "dad movies." Nevertheless, they gasped — and a couple of them applauded — when I played this teaser for them and they realized what it was. If I knew Rian Johnson was in charge, I'd be intrigued. But it's Abrams, so I wouldn't call my perspective "a new hope." I'll confess, I'm optimistic (someone has to be!). I revisited Force Awakens this last year and enjoyed it much more than my first viewing, and I truly loved Last Jedi. I will admit, I teared up a bit seeing Leia hugging Rey through tears. It's an emotionally manipulative moment in the trailer, and...well...it worked on me. I'm with you. It worked for me, but I've always been more invested in Star Wars than most of the rest of the folks here anyway.